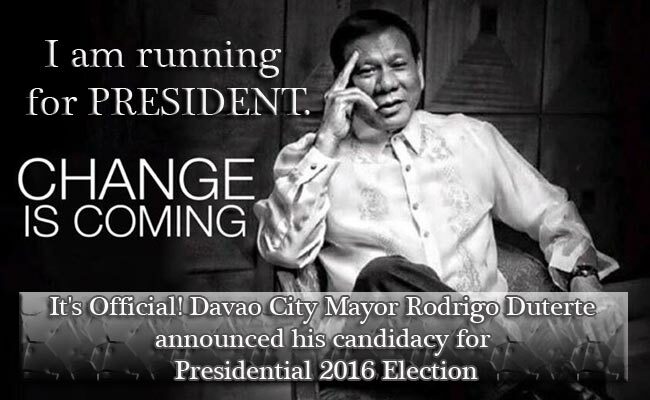 After months of speculations, Davao City Mayor Rodrigo Duterte finally ( though not yet formally) announced his candidacy for the presidential seat in 2016 elections. The Davao Mayor said in a function in Ilo- ilo City on November 21, that he will run despite his reasons not to. For the past few months the stern mayor repeatedly said that he was not interested in running for presidency, but when the decision of the Senate tribunal has favored Senator Grace Poe in her disqualification case, he had decided to finally run. As a lawyer Duterte believes that the Constitution holds the country together and Poe, as a foundling, is not considered as a natural born Filipino, making her not qualified to be a president. A few months ago, the mayor shared that he does not have the desire to be a president as he lacks enthusiasm, lacks funding and his family strongly opposed with the idea, yet with the SET deciding to let Grace Poe run for presidency despite questions on her nationality ultimately changed his mind. Duterte is now looking for an opportunity ta have a meeting with Partido Demokratiko Pilipino-Lakas ng Bayan leadership for the presidential slot they are offering as their bet had withdrawn his candidacy. He is now interested to talk with PDP-Laban president Senator Aquilino "Koko" Pimentel III to consult him about filing his certificate of candidacy. Duterte then shared that once PDP-Laban gives their blessing, he would then formally announce his candidacy. As for his candidacy as Davao’s mayor, he hopes that his daughter Sara will run in his place. Sara Duterte was also once a mayor of the city, and she is also known for her iron fist leadership just like her father. Duterte further explained that he would run for presidency rather than let an American citizen run the country as a president if Poe wins the election. He admitted that he is terribly disappointed with the Senate tribunal’s decision for letting a not natural born Filipino to run for presidency. The mayor cited that while United Nations Convention on the Reduction of Statelessness gives a foundling the right to be deemed as a citizen, it does not make a foundling as a natural born citizen. One of the requirements in running for the highest government position is to be a natural born Filipino. The SET’s decision made it seem that a naturalized citizen can then also run for presidency. Duterte shared that the requirement is exacting as the presidency is deemed sacred. Duterte clarified that he has no personal issues with Grace Poe, but he would rather have a Badjao, s plumber or a carpenter as long as the president is a natural born Filipino. He also cited that there had been reports that the senator even used her American passport in her trips abroad. Such an action means that she had renounced her Philippine citizenship if based on the rule of the Supreme Court. If elected as the president, Duterte said that people will be assured that something will be done. He specifically said that he will put up a railway system along Pasig River, he would make citizens feel safe to walk in the middle of the night, act on the Metro Manila traffic, and answer the challenges in the airports. Duterte, firm as he is known, said that he would not let corruption be in his way or else he would do things his way. He assured the people that something will be done as he sits as a president or he would not run at all.